Valentines day is round the corner and so I am here with these easy and colorful beetroot pancakes as a treat. 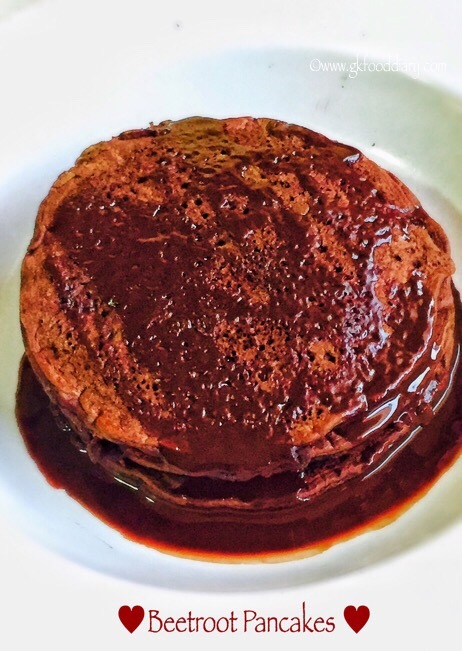 I have tried this pancakes similar to the oats pancakes which I posted a while back. The pancakes were so good that finished in no time, the little one so loved it. Do try this for your little valentine and celebrate love! 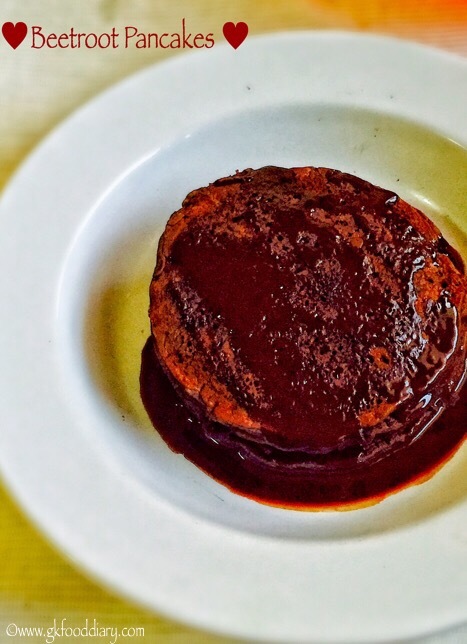 You can give this beetroot pancakes to your toddlers/kids at breakfast/dinner or as a snack. 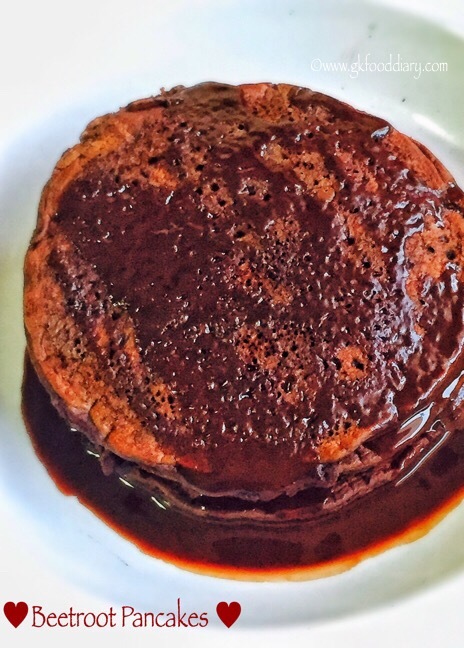 It can be served with honey, homemade date syrup or homemade chocolate syrup. 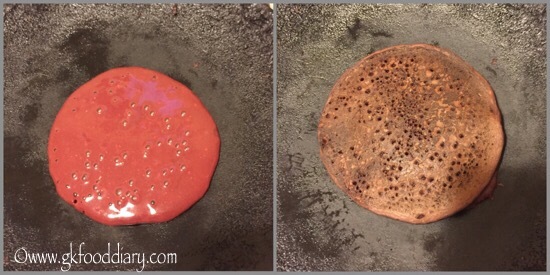 Let’s get on to check how to make this beetroot pancakes recipe for toddlers & kids. Beetroot pancakes - easy pancakes recipe with beetroots, whole wheat flour & eggs. 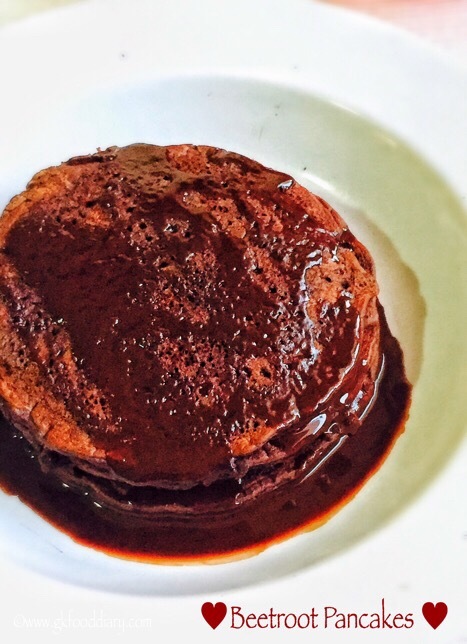 Easy and super healthy pancakes for toddlers & kids. Wash and peel beetroots. Cut them into cubes. Steam cook or pressure cook the beetroots. 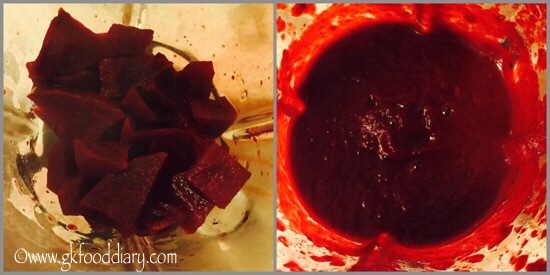 Once the beetroots are cooked, puree them in a blender until smooth. Set aside. Measure whole wheat flour, cocoa powder, milk, sugar/Jaggery. Keep it ready along with other ingredients. 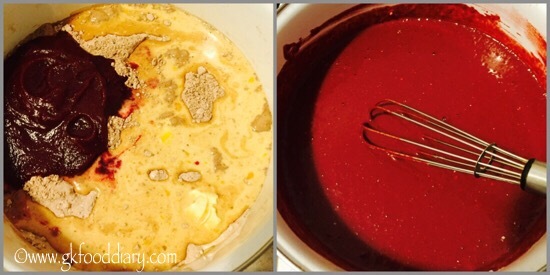 In a bowl, add whole wheat flour, sugar, cocoa powder, salt and baking soda. Mix well. In another bowl, add milk, eggs, butter, vannila extract and mix well with a whisk. Now combine everything along with beetroot puree. Mix well so that no lumps are formed. The batter should be like regular dosa batter consistency neither too thick nor runny. Set aside for 10 minutes. Heat a pan or tawa, add a laddle of batter to it and spread it to form a circle. Don't spread too much. Cook until brown on one side for five minutes and flip the pancake. Cook for a minute and remove from the pan. Repeat the same process for the remaining batter. 1. 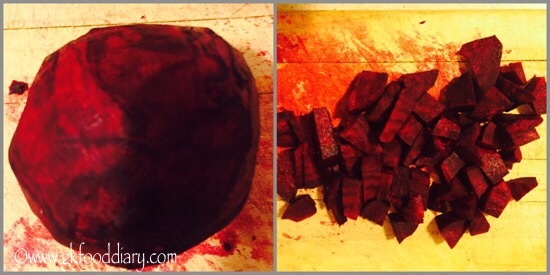 Wash and peel beetroots. Cut them into cubes. Steam cook or pressure cook the beetroots. 2. Once the beetroots are cooked, puree them in a blender until smooth. Set aside. 3. Measure whole wheat flour, cocoa powder, milk, sugar/Jaggery. Keep it ready along with other ingredients. 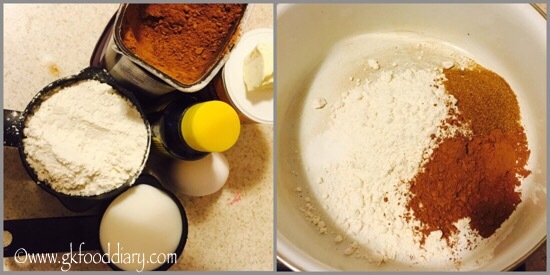 In a bowl, add whole wheat flour, sugar, cocoa powder, salt and baking soda. Mix well. 4. 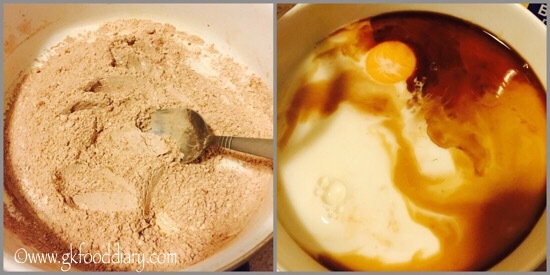 In another bowl, add milk, eggs, butter, vannila extract and mix well with a whisk. 5. Now combine everything along with beetroot puree. Mix well so that no lumps are formed. The batter should be like regular dosa batter consistency neither too thick nor runny. Set aside for 10 minutes. 6. Heat a pan or tawa, add a laddle of batter to it and spread it to form a circle. Don’t spread too much. Cook until brown on one side for five minutes and flip the pancake. Cook for a minute and remove from the pan. Repeat the same process for the remaining batter. The delicious beetroot pancakes is ready ! Top it with syrup of your choice ! Vegetarians can skip eggs and try eggless version. Don’t spread it too thin, otherwise it may stick to the tawa. Always cook the pancakes in low medium flame otherwise it will be burnt.